Most people experience knee pain at some point in their lives, it is one of the most common physical injuries and has many possible causes. There are many reasons you may be experiencing knee pain, and we are equipped to accurately diagnose and effectively treat all of them. Common causes of knee pain include the gradual wearing down of the knees, such as that caused by arthritis, and acute injuries, such as a torn meniscus. Left untreated, many knee problems can hinder movement, worsen over time, or eventually require surgery. Sports, exercise and other activities can cause muscle strains, tendinitis, and more serious injuries to ligaments and cartilage in the knee. 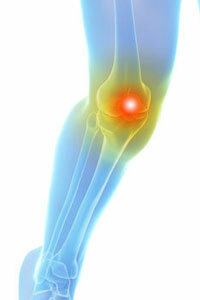 The location of the knee pain can vary depending on which structure is involved. Any time you experience knee pain, you should consider treatment. However, there are a number of symptoms that signal a need to seek immediate medical treatment. If you are unsure of the cause of your knee pain symptoms, or if you do not know the specific type of treatment for your condition, you should seek medical attention. Treatment of knee pain must be directed at the source cause of your knee pain, not just the symptoms. Most people will not need knee surgery but, in many cases, surgery may be effective in minimizing or eliminating your knee pain when other treatment methods have failed. Often the first surgical treatment for knee osteoarthritis is arthroscopy, a procedure used to see, diagnose, and treat problems inside the joint. Arthroscopy typically involves inserting a small camera into the knee and then treating identifiable problems. Corticosteroid injections have been used for a very long time. Their anti-inflammatory and pain relief properties have made its use become very common practice within the medical community and society as a whole. They have been shown to be effective in decreasing the inflammation and pain of ligament injuries for up to 8 weeks. Conditions with inflammation causing pain such as arthritis can be treated effectively and usually bring a return to normal activity functions in short order, thereby postponing or eliminating invasive procedures such as joint replacement surgery. Prolotherapy is different from traditional medical treatments. It is part of an exciting branch of medicine called Regenerative Medicine. It uses the power of our own body to heal an injured tissue. This injured tissue could be a torn tendon in the shoulder, a torn meniscus in the knee, damaged cartilage in osteoarthritis, or a damaged tendon in in the tennis elbow or plantar fasciitis. Platelets rush to the site of inflammation releasing a variety of healing growth factors. This results in accelerated repair of the injury. Pain relief and functional recovery is significant. Most importantly in most cases we can avoid the use of medications and in some cases avoid surgery. Recovery time is minimal with most patients working during the treatment. Many fractures and injuries around the knee require surgery to fully restore function to your leg. In some cases, such as many ACL tears, surgery can be done arthroscopically using miniature instruments and small incisions. Many major injuries require open surgery with a larger incision that provides your surgeon with a more direct view and easier access to the injured structures. Your knee is made up of many important structures, any of which can be injured. The most common knee injuries include fractures around the knee, dislocation, cartilage injuries, bursitis, patellar tendinitis, torn meniscus, sprains, and tears of soft tissues like ligaments. In many cases, injuries involve more than one structure in the knee. Pain and swelling are the most common signs of knee injury. In addition, your knee may catch or lock up. Many knee injuries cause instability — the feeling that your knee is giving way. Left untreated many knee problems can hinder movement, worsen over time, or eventually require surgery. But there is a variety of knee pain treatment options, from minimal invasive treatments to knee replacement. The most common bone broken around the knee is the patella. The ends of the femur and tibia where they meet to form the knee joint can also be fractured. Many fractures around the knee are caused by high energy trauma, such as falls from significant heights and motor vehicle collisions. A dislocation occurs when the bones of the knee are out of place, either completely or partially. For example, the femur and tibia can be forced out of alignment, and the patella can also slip out of place. Dislocations can be caused by an abnormality in the structure of a person’s knee. In people who have normal knee structure, dislocations are most often caused by high energy trauma, such as falls, motor vehicle crashes, and sports-related contact. The Anterior Cruciate Ligament (ACL) is one of two “crossing ligaments” along with the PCL and attaches the back of the femur to the front of the tibia. The main functions of the ACL are to prevent excessive forward movement of the tibia on the femur and control the knee during twisting and rotational movements. Changing direction rapidly or landing from a jump incorrectly can tear the ACL. About half of all injuries to the ACL occur along with damage to other structures in the knee, such as articular cartilage, meniscus, or other ligaments. The posterior cruciate ligament (PCL) is about two inches long and connects the femur to the tibia at the back of the knee. It limits the backward or posterior motion of the tibia. Twisting or overextending the knee can cause the PCL to tear, leaving the knee unstable and potentially unable to support a person’s full body weight. The PCL is the strongest ligament in the knee, and tears often are associated with traumatic injuries rather than sports injuries. PCL tears can happen when the knee is violently forced backward or when the front of the shin is hit hard, for example when the knee strikes the dashboard during a car accident. Injuries to the collateral ligaments are usually caused by a force that pushes the knee sideways. These are often contact injuries. Injuries to the MCL are usually caused by a direct blow to the outside of the knee, and are often sports-related. Blows to the inside of the knee that push the knee outwards may injure the lateral collateral ligament. Lateral collateral ligament tears occur less frequently than other knee injuries. The meniscus is a C-shaped piece of tough, rubbery cartilage that acts as a shock absorber between your shinbone and your thighbone. A torn meniscus is one of the most common knee injuries, resulting in knee pain. Any activity that causes you to forcefully twist or rotate your knee, especially when putting the pressure of your full weight on it, can lead to a torn meniscus. Meniscal tears may also occur as a result of arthritis or aging. The quadriceps and patellar tendons can be stretched and torn, resulting in knee pain and swelling. Although anyone can injure these tendons, tears are more common among middle-aged people who play running or jumping sports. Falls, direct force to the front of the knee, and landing awkwardly from a jump are common causes of knee tendon injuries. The Patellar Tendon works with the muscles in the front of your thigh – the quadriceps – to straighten your leg. Although anyone can injure the patellar tendon, tears are more common among middle-aged people who play running or jumping sports. A complete tear of the patellar tendon is a disabling injury. It usually requires surgery to regain full knee function. The Quadriceps Tendon works with the muscles in the front of your thigh — the quadriceps — to straighten your leg. Although anyone can injure the quadriceps tendon, tears are more common among middle-aged people who play running or jumping sports. A complete tear of the quadriceps tendon is a disabling injury. It usually requires surgery to regain full knee function. Knee replacement surgery, also called arthroplasty, is a surgical procedure to resurface a knee damaged by arthritis or knee injury. While this type of surgery is major surgery, it is often the best option for people who suffer extensive knee pain and damage. Metal and plastic parts are used to cap the ends of the bones that form the knee joint, along with the kneecap. This surgery may be considered for someone who has severe arthritis or a severe knee injury. By relieving this pain with knee replacement surgery, doctors can help to restore a normal activity level to people who have exhausted their other options for pain management. While the surgery comes with risks, such as clots, scarring and infection, and will limit certain activities, such as jogging, its benefits often outweigh its risks by dramatically increasing the patient’s quality of life.